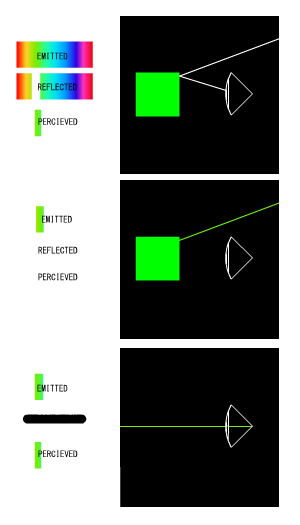 Below is a diagram as to how I understand light and its behavior in the physical world at a rudimentary level. My question is whether we interpret the absence of a wavelength as a certain color, the solitude of a wavelength as the color, or both. If you emit white light at a "green" object, my understanding is that it will absorb the green light and reflect everything else. That is why if you shine a green light on a green object, it will appear as black, since little to no light is reflecting. However, we can interpret the emission of that green light as green, where the sole present wavelength is the green wavelength, but we still understand it as the same color. It may be as simple as "both are true" but I'm curious if there's something I'm missing or not. That's not quiet correct ...if you shine white light on a green object it will reflect the green , that's why it appears green ...it will absorb the other frequencies . the absence of light can be called black or darkness. but this is not the case for white light, which breaks down into the seven colors passing through a prism. you shine a certain colored wavelength of light, it is as straightforward as, as projecting the same color you expect it. Note that the "seven" colours are a human invented convention. There is actually a continuous spectrum of colour. rather than that he thought he could see 7 colours. Thinking back this makes a lot more sense than I want to admit. For some reason I'd thought that they absorbed their respective color, thanks for the response though, it solved my conundrum.